Here is what I did with the challenge! it’s called Poppy Birthday. I paired it up with this great jar stamp that I picked up at a local craft store! pieced back together, and then raised with some Stampin Up pop dots. again and made my jar see through like I have done in the past. Love that look! The jar is also heat embossed with white embossing powder. The arrow stamp is something I picked up at Michaels. I ran my leaves through my Cuttelbug using the Lattice folder. That pretty much sums up most of my design! so the more you play the more chances you have to be a JUGs Guest Designer! Here are the links to help get you started! Categories: Cards | Tags: Card making, Cards, cuttlebug, Happy Birthday, heat embossing, rubber stamps, stamping, vellum, Verve Stamps | Permalink. Love these flowers, Nancy! That vellum jar and tiny heart look just super over the stems! Love the arrow detail, too! You rocked this challenge! Love the bright red and black together! That jar stamp is great, and I love it in vellum…..makes it look real. Also, crazy about that flower stamp, so happy looking! Great job! Your choice to use vellum really makes the flowers look like they are in the jar. I haven’t done much paper piecing but maybe it’s time I try it for this challenge. My favorite jar and I also love those flowers! 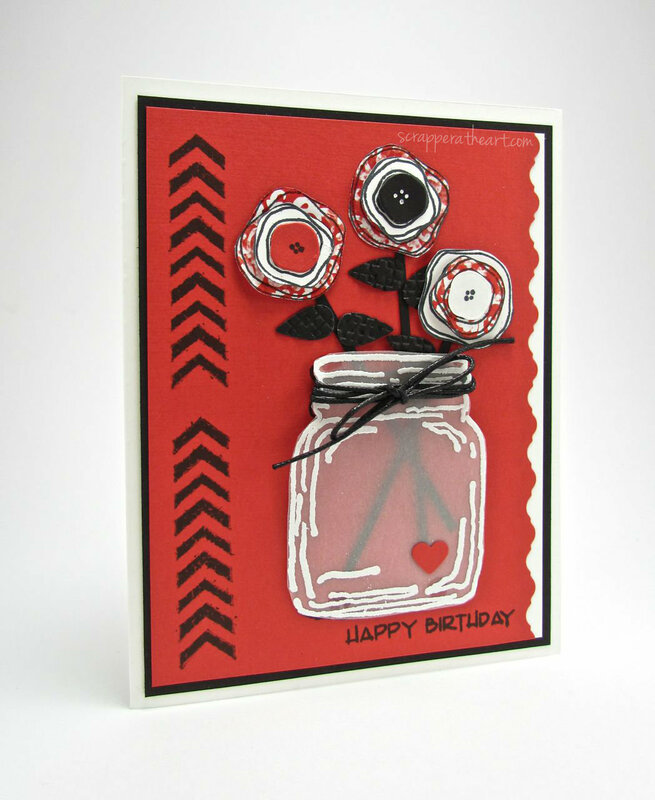 Love that mason jar and way to flash the Verve!! Great paper pieced poppies! Your flowers look amazing and love how they are in the vellum jar. And cute addition with the little red heart. Best vellum jar I have ever seen! Beautiful paper pieced flowers, love the black & red! Well done! You sure did a lot of work cutting those flowers- with an excellent payoff! This card is fun! I love these paper pieced flowers and the pretty vellum jar! That is the best jar stamp ever! much… I do love this stamp!!! Wonderful card! The embossed leaves, vellum jar, pp flowers–make for a terrific creation! Thanks for your sweet comment… I really appreciate it!! !